Daytona is the center of Florida’s Fun Coast, so get ready to have the time of your life! Daytona Beach has been consistently rated one of the top Florida spring break party towns for years, and the party doesn’t stop when the kids go home. 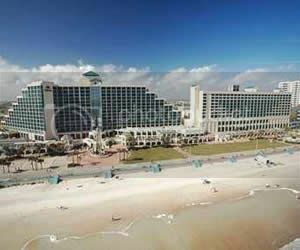 Beachfront Hotels in Daytona are abundant, and with competition comes rate wars, and the only winners of this severe competition are the guests! Daytona is home to the most affordable beachfront Florida hotels around. That means you will have more money to enjoy the exciting nightlife. This Atlantic Coast city is also home to a large convention center that host many concerts and events all year long. The Daytona International Speedway is minutes away, so NASCAR lovers can also enjoy beachfront accommodations. If you are not looking to party, that’s alright too. The selection of cheap hotels in Daytona offer value conscious and budget vacationers a chance enjoy the beach with out breaking the bank. As a part of Ocean Walk Village, a $400 million entertainment and vacation destination, the Hilton Daytona Beach Oceanfront Resort ranks among the finest hotels on Florida’s Atlantic Coast. This beachfront hotel offers a total of 744 guest rooms, suites, and cabanas and a majority of the rooms feature breath-taking views. Combine the outstanding accommodations with impeccable service and an abundance of amenities, guests of the Hilton in Daytona Beach are sure to enjoy the beachfront vacation they have been dreaming of. Be sure to plan your trip in advance, this hotel sells out quickly in peak times! 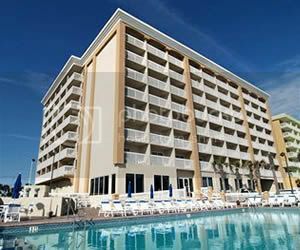 With an emphasis on value, this beachfront Daytona hotel truly stands out among the rest. At the Bahama House, every room offers a view of the Ocean and includes a complimentary continental breakfast, daily newspaper, cocktail reception, fresh baked cookies, and high speed internet. Most rooms also include a full kitchen, making this location the ideal choice for value conscious or budget travelers who are not willing to sacrifice a beachfront view or quality. The Bahama House also consistently ranks among the top hotels in Daytona Beach on Tripadvisor, so your know this is the real deal! Minutes from the Daytona International Speedway but still on the beach, race fans, business travelers, and vacationers alike are sure to enjoy the Hampton Inn. This Daytona Beach Shores hotel prides itself on offering comfortable updated accommodations paired with unmatched hospitality and customer service. Guest of the Hampton Inn will enjoy the beachfront pool, hot tub, and Oceanside festivities. With the feel and service of a 5 star hotel, without the stuffiness, and a price this affordable, the Hampton Inn will surpass every guest’s expectations.